Avid on Thursday announced its first iPad application, Avid Scorch. Based on the same engine as Avid’s own Sibelius music notation software, Scorch lets you import your existing Sibelius files or purchase and download sheet music from its own in-app store. Not only does Scorch let you take your whole sheet music library with you, it also allows you to customize it in real time. 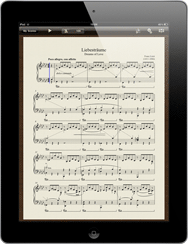 It has a playback feature that lets you hear the score, slow it down to help learn difficult passages, and transpose the score on the fly. You can change instrumentation to hear how a flute might sound instead of a trumpet, for example. You can also convert the score to and from guitar tabs. Scorch has a built-in mixer that allows you to bring an instrument’s volume up or down in the mix. Targeted at composers, arrangers, professional musicians, and the education market, Scorch offers a full-screen Music Stand mode that lets you turn the page with a simple tap on the screen or with a Bluetooth footswitch. You can customize the color and texture of the paper as well as the font, which can help visually impaired and dyslexic musicians. The Scorch store offers over 150,000 downloads. Individual titles in the in-app store run between free and $10, and many are titles from major publishers like Hal Leonard. Typically, guitar tabs cost $1 and typical piano/vocal/guitar arrangements cost $4. You can even sign up for an account at Sibeliusmusic.com and sell your scores to other Scorch users. Avid Scorch is available now from the App Store for an introductory price of $5.The price goes up to $8 on July 31.